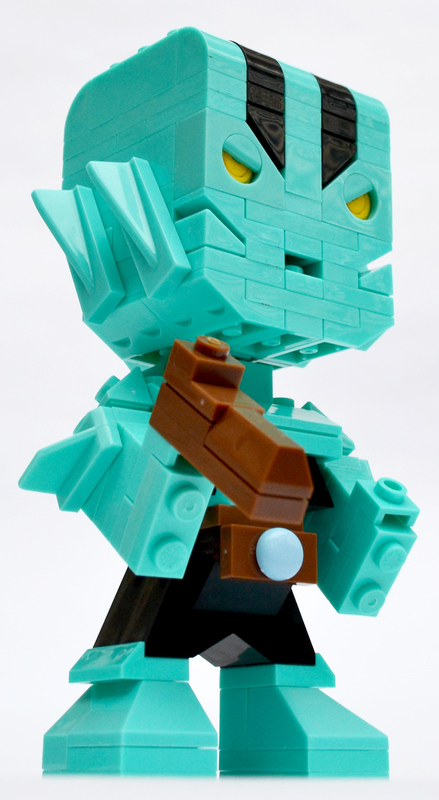 Abe Sapien Kit by Mega Construx | 'TAIN'T THE MEAT… IT'S THE HUMANITY! 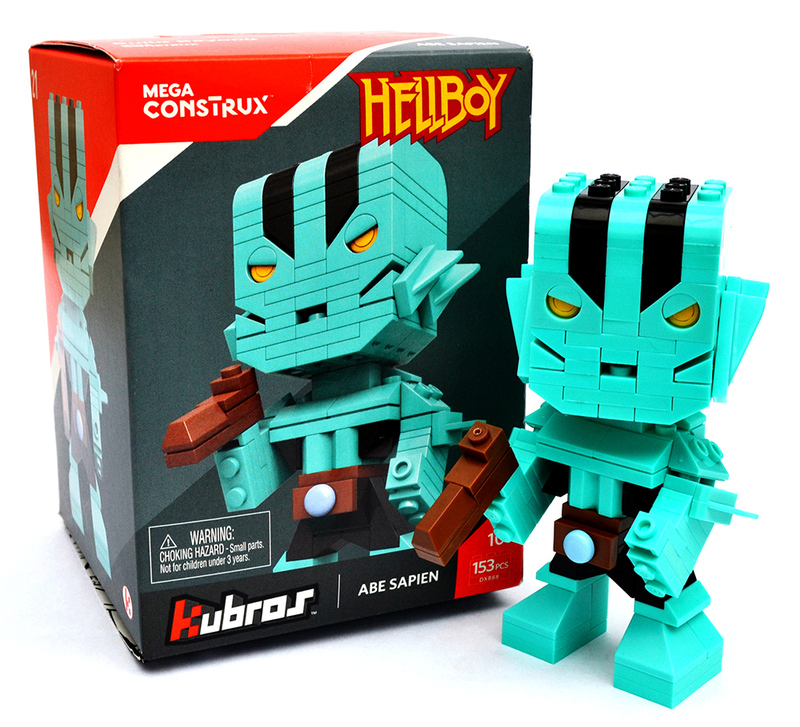 Last week I took a look at a Mega Blok’s Hellboy construction kit, so it seems only fair to take a closer look at the other Hellboy character in the range: Abe Sapien. Created by comic book artist and writer Mike Mignola, who also created Hellboy, merman Abe Sapien first appeared in the Hellboy: Seed of Destruction storyline in 1994. The character proved popular with readers and he quickly went on to star in the long-running spin-off from Hellboy, B.P.R.D. (Bureau for Paranormal Research and Defence). 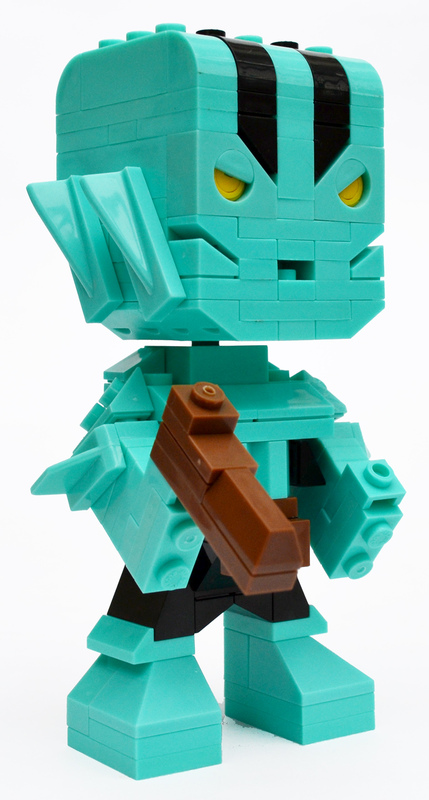 This Abe Sapien construction kit was released by Mega Construx, part of the Mega Bloks toy company. The build is also labelled ‘Kubros’, but for the life of me I don’t know why. But before we get into the nitty-gritty of the model, let’s take a quick look at the packaging. The kit comes in a box measuring 6 x 4 inches, with artwork that features photographs of the toy as well as a Mignola illustration of Abe. The back shows six other figures in this Mega Construx range of toys: Abe Sapien is number 21 in the series. The packaging is colourful and cleanly designed; the photographs feature spot varnish (always a nice touch) and overall the box is very attractive and eye-catching. Although the box is glued at the top, the bottom flaps are not, and are instead held closed with tape which can easily be removed if you don’t want to damage the packaging when opening it. 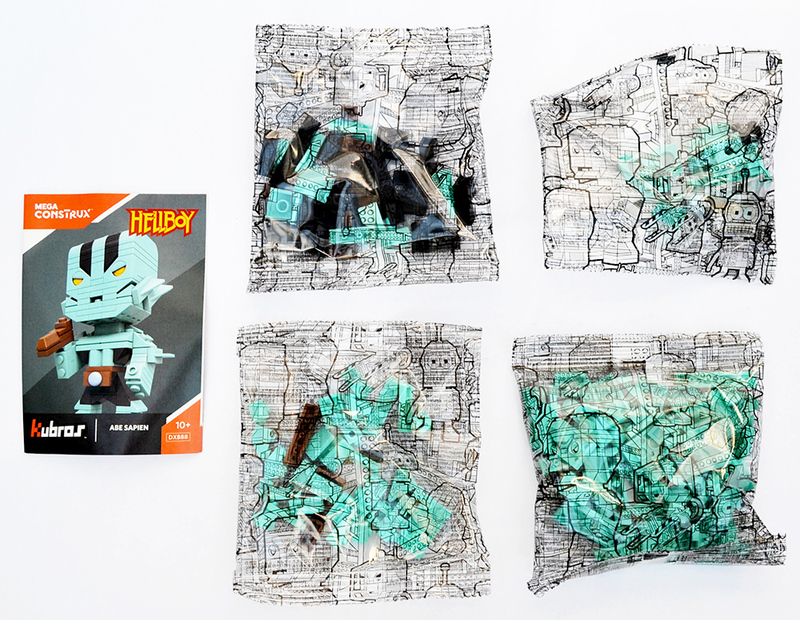 Inside the box are four transparent bags that contain the 153 pieces needed to build the model, as well as a 32-page full-colour instruction booklet. When building the toy you’ll quickly discover that there is no real order to the pieces in the bags, so you just have to open them all and dump everything out before you start building. The booklet is straightforward and simple to follow, and is illustrated with clear pictograms that are very similar to the instructions found in Lego sets (which, let’s face it, Mega Bloks have basically ripped off copied). The kit took me about about 45 minutes to make; all the pieces where there and I had four extra pieces left over (again, this is a trait Mega Bloks shares with Lego). Abe measures five inches in height when completed, and looks pretty good: I like the black stripes on his head, as well as the fins on the side of his face. Also included is a gold Kubros ‘K’ logo that fits into Abe’s right heel, which is a nice touch. The toy features three points of articulation: his head and arms all move (the fins on the side of his face can also be rotated). Like the Hellboy model Abe’s eyelids can also be rotated so he either looks angry, sleepy or happy — I prefer the angry look. Overall this is a nice figure, one that’s well constructed and fun to make, and it looks pretty cool on a shelf next to Hellboy. As for price, these Mega Construx kits seem to retail for £7/$10, or thereabouts. I picked up a job lot of three — Abe Sapien, Spartan Recon from Halo, and Fry from Futurama — for £15 on eBay, which is about fair. I’m not sure I’d want to pay more than a fiver for each one. Abe Sapien, from all sides. All-in-all this Abe Sapien construction kit was a fun and diverting little toy, one that kept me busy for the better part of an hour. And for a fiver I’ve no complaints about the price. 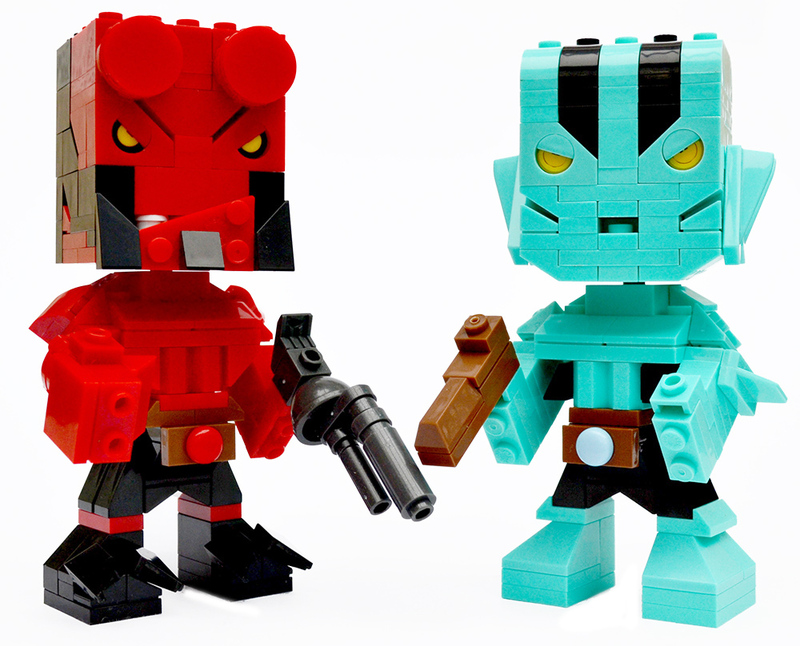 To my knowledge these Abe Sapien and Hellboy brick construction sets are the only ones licensed from the Hellboy franchise, so fans of the comic (and Lego) should find something here to enjoy, I know I did.